If for every countif() I write excel paid me a dollar, I would be a millionaire by now. It is such a versatile and fun formula to work with that I have decided to write about it as third post in our spreadcheats series. Using COUNTIF() to replace pivot tables: We all know that you can use countif() to replace pivot tables for simple data summarization. For eg. if you have customer data in a table and you would like to know how many customers you have in each city you can use countif() to find that. Note: This method works as long as phone numbers have identifiable calling codes and stored as text. To covert a number to text you can use text() or append an empty space to the number. Pattern matching: Often when you extract data from other sources and paste it in excel it is difficult to process it when the formats are not consistent. For eg. when you copy address data of a bunch of customers and need to know how many customers are in “New York” you can use countif like this: countif("data range", "*new york*"), the operator * tells excel to match any cell with new york in it, not necessarily at the beginning or end of the cell. Counting positive numbers in a range: Again we use the > operator to count the positive numbers in a range like this: countif("data-range",">0"). As a replacement to FIND(): Excel FIND() is powerful formula to find if a particular text occurred in another text. But one problem with find is it returns #value! error if the value you are looking for is not in the input cell. What if all you need to know was whether your cells had a particular value or not?You are right, you can use COUNTIF() for that too, like: countif("cell-you-want-to-look","*hilton*") will return 1 or 0. Findout the number of errors in a sheet: The beauty of countif() is that you can even count error cells. For eg. you can use it like: =COUNTIF(1:33,"#VALUE!") to findout how many #VALUE! errors were there in the rows from 1 to 33. This can be useful if you are building a complex model and need to keep track of errors. Most of the tricks should work with SUMIF() as well. If you like this, read the other posts in the spreadcheats series. It is a 30 post series (3 posted so far) that aspires to make YOU very good in using excel to solve day to day problems. I'm on of those LifeHackers that have invaded your blog. I must say that I love the simple style you use - I've already pointed a number of coworkers to your blog for hints and tricks to relieve myself of the some of the work that comes with being the resident Office guru. One thing that would be great for this series is a review of v/hlookup vs. the Index/Match combination. I can always tell when someone ready to go to the next level when they discover vlookup but using that command really pumps up the file size in older versions of excel (pre '07). Index(entire range, use Match on the vertical list, use Match on the horizontal list) is so much more versatile - you can change the order of columns, rows, and pick out items that are left of the lookup. It also is very easy on the file size (a plus when you have to email files under the draconian limits of the mail attachment size. Look forward to your future posts - you're my newest Google Reader feed! I am soooo happy you were able to use some of this and sharing it with others. I am going to write about offset / vlookup as part of the spreadcheats, may be this week. I hope some of these questions can be answered. first when i read your website name i found it funny i thought what that chandoo can do with that similar name but when i continue reading your work and find out how its pro and well explained im surprised man and be sure you are the first and only one in my bookmarks concerning Excel !! This is the first place i search when i have some difficulty in excel. I am trying to provide summary analysis from a Raw data for eg production tickets. Here I would like to display a table which shows no. of High, Medium and Low issues with respect to OPEN, CLOSED and HOLD parameters. I wanted to do without using excel pivot tables. Can you please let me know the way on doing this. copy paste the formula over the 8 remaining cells and you should have what you are looking for. @Joanne' did you check out our how to do employee satisfaction surveys in excel post? Given a table with fields for invoice dates and invoice total, I want to take a years worth of data and break it into monthly sales to make bar graphs. I read with interest your tutorial on countif but it is still beyond me. Hi, I'm having problems with SUMIF when taking values from other excel files: if the files are not open it gives me error "#value!". Since I'm using about 50 different files I can't open and close all of them all the time (even doing it with woorkbooks_open/close). @Tania: Working with several files is a very expensive operation. But it is still possible. By using the full physical path of the file in the reference of SUMIF you can get the contents of the files even when they are closed. Let me know if you face some difficulty implementing this. @Forrest: You can use the month() function to extract month from any date. So create a new column where you can extract this month data and then pass it to sumif(). I discovered your site about 5 months ago and use is everytime i hit a hurdle in Excel or need creative graphing ideas. Because of your site my bosses consider me our teams Excel expert. I think what makes this site the best resource for intermediate Excel users like me is that you explain everything simply and in a stepwise fashion and then you make available the ground covered in an Excel file which i can save and against which i can compare my own interpretation of the tip using my own data. I guess that's just a long way of saying thanks a mil, man! @Kyle.. You are welcome.. I am happy you enjoy the site. I love this site and recomend to all my friends. @Izabel... Thanks for your comment and love. Welcome to PHD. replace the =1 with =2 to get =4. Chandoo, thanks for your posts. I want do calucate the band wise like the below. I want count how many numbers are in the below band and their sums as well. Kindly advice me, which formula to use. I am really having a problem with Data comparison and your blog has been like an eye oppener to me so thank you. I have like a "special request", do you mind telling me how i would go round the issue i am currently facing? I have two systems at the office. 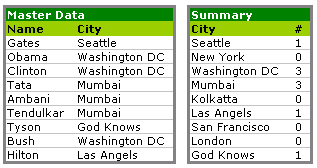 when i copy Data from one place and paste it to another the Data formats are slightly different. one is 07:00:00 AM and the other is 07:00:00 with no AM nor PM you basically have to do that on your own. I do nto have any strong knowlage with excell so please bare with me. so the issue is i need a formula that will look at Data in cell A and B then if there is a match it higlites them. Or if it were possible whenver it could get a match, it pastes the names(that match) from cell C and pastes them to D.
your soonest assistance will be appreciated. My job almost depends on this. Checked your site on a "countif" issue, but could not find a solution. My problem is dat in de data I have names (not months) names starting with MAR. eg MAR01 and MARC1. Applying a count if on this data adds up both names as they are both march-01. But in really MAR01 and MARC1 are both names for totally different groups. I already converted to text, added ' in front, but nothing worked... do you have a solution? How can I prevent that Excel reeds dates in column A instead of names? As the formula counts all "MARC1" I would expect the result being 2, not 4. Thats interesting and I can't explain why Marc1 seems to be equal to Mar01 ? @Hui, thanks for this solution! I am trying to count the number of previous cells that are greater than zero. The tricky part is it should stop counting if hits a previous cell with zero value. Which means at current cell it should count the values greater than zero upto a point where the previous cells have greater than zero values and stop counting when one of the previous cells have a zero value. Thanks for your reply. Below is the sample data with manual calculation. The date and value column are the one user provides and the count column should be generated with a "COUNTIF" of "SUMIF" formula such that at each cell it calculates the count of values greater than zero for previous cells until it reaches one of the previous cell that has a zero value. Basically I would like to know how many values are greater than zero before. I see that in my previous post the columns are not seen with spaces. I have inserted commas to differentiate between each columns. I will have to have a think about it. Interesting question as Hui says. You have some useful info here. I am tryng to use COUNTIF to count the number of < and = signs, the actual operators themselves. The ~ that you can use to put before special characters, like * and ? does not work for < and =. Hey, a lot of useful info here. Maybe do You know, how to sum numbers(money spent) if there is a word "food", but cell to sum with a number is from the right of the cell with a word. =SUMIFS(D4:D9;C4:C9;"*likutis*"), only works with two columns, the thing is that, I want to add F4;F9:E4;E9 and 29 more. any help on this ? Having trouble with a formula that uses multiple if/then statements. It is a multiple rate structure that is base on a given variable. IE....if a customer uses 25,000 gallons of water he is charged based on the rate structure of usage between 0 and 3,000 gallons, and another rate for 4-10,000 gallons and then 11-20,000 gallons and then over 21,000 gallons. Any ideas....I am just a basic excel user...haven't used all the functions before. Thanks...I will try that and see how that works. em afsar ali from pakistan. I found your tuturials very informative and helpfull. I want you to help me out regarding duplicate entry in excel. what I need is to prevent duplicate entry of clients when any two or three cells in the row matches with another cells in the other row by giving a warning messege at your ealier considrations. I need this despretly..
is it possible to make it onexcell sheet. What data defines a Boy or Girl ? How to Count the No.of Male in SC/BC/MBC/...??? How to Count the No.of Female in SC/BC/MBC/...??? I really like how you did the formula for tracking the repeating customers at a store for the last 30 days. I am trying to track license plates for the last 30 days, and making a column that will automatically count the number of times a license plate shows up in the last 30 days. Can I get any help with that? Thank you very much for a great website. Oh yeah, I would also like the cell to change color (yellow if 9, and red if 10 or above). I can do this part on my own now, but to add it to an existing formula, is what I am not sure about. Again, thank you for any help. I am using the following formula, wherein I have given the entire file name in cells A10, A11, B10, B11, but it is not working. Can you please suggest a crack to this? Yes, but I want the formula to return the value that when they are counted is greater than 10 but less than 25. In this case it would be 7. Do you know how I can write that formula?? What if it is less than 10 or greater than 25? Ok, since you asked! 🙂 I would like 3 separate formulas: One that returns the count if the value is 10 or less, then the next would be the count if it is greater than 10 but less than 26 and then the final wouns be greater than 26 but less than 51. This is going to be used to calculate commissions at 3 different levels. I appreciate any help or guidance you could provide! You're the bomb! I have everything I need now. Thanks for all your patience and help. i want to ALL Short key Advanced Excel. In a class, the name start with Maung, Saw, Min & Khun are Male and Ma, Nan,Mi are Female. How to separate Male or Female using excel 2007. Please give me answer for my Question. Thank you . really we can learn more and more from here.. I want to count the cell which are green colored in between the particular range of cells. for ex: (A1:D20) In which may cells are blank and some cells are green and we can not use filter to count. How can i able to count those cells by Using formula is there any way to count it?? Having a problem! I need to find the threshold (999999.99) of revenue and add 14% vat once this has been reached. I have this at the moment =(C9>=999999.99,0.14*C9,0.14*C9) and this returns the value for all amounts. I only need it for threshold. if the time range is from 06:00 - 15:00 then it should be "1st shift"
Tried using IF but no lock. Any help would be of great help. Thanks in advance! i have a little problem which i want solution. and which formula will i use to find the pairs. please help me excel Gurus.